The former first lady struck again Oct. 30. She tweeted, "We need to end private prisons. Protecting public safety…should never be outsourced or left to unaccountable corporations." Prison stocks promptly took a dive. Corrections Corp. of America (NYSE: CXW) fell as much as 6% when the tweet surfaced – a $200 million loss of value. The GEO Group Inc. (NYSE: GEO) slipped as much as 4.2% for a $100 million loss. 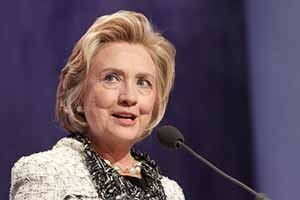 But there's one sector that is proving impervious to Hillary Clinton rants. In fact, the last time a politician took aim at this industry, it doubled during the worst financial crisis in recent memory. Hillary Clinton – and President Obama – have supported antigun legislation for decades. They've both been on record as wanting to limit purchases, ban concealed carry permits, increase gun maker liability, and reintroduce the expired Federal Assault Weapons Ban, among other things. "You'd think the industry would crumble under that sort of onslaught, considering it's coming directly from the top," Money Morning Chief Investment Strategist Keith Fitz-Gerald said on Oct. 29. "In fact, exactly the opposite has happened. Guns, firearms, and ammunition have flown off the shelves since Obama's election in 2008." Most people are unaware that the gun industry's economic output doubled from 2008-2011, rising from $6.8 billion to $13.6 billion at a time when the limping U.S. economy grew just 11% by comparison. By the end of President Obama's first term, Smith & Wesson Holding Corp. (Nasdaq: SWHC) had surged more than 272%, outpacing the gains of the S&P 500 by more than 3-to-1 despite a historic bull market fostered by the Fed's cheap money policies. Three years later and growth hasn't slowed. SWHC stock is up another 100% and may rack up $600 million in sales this year, a 50% increase from 2010 levels. "As impressive as those figures are from a financial perspective, they're a fraction of what could happen next," Fitz-Gerald said. During an October campaign rally in Florida, Hillary Clinton vowed to use executive action if Congress wouldn't pass enhanced background checks. It's a promise she's repeated at several rallies and even at the Democratic debate held earlier this month. "I believe a Clinton victory will create a gun-buying frenzy that positively dwarfs anything that the Obama administration has brought on to date," Fitz-Gerald said. "Gun control is one of the very few issues Hillary can use to maneuver to the left of her primary rival, self-declared socialist Bernie Sanders. He's from rural Vermont where gun ownership is popular, and he's cultivated a voting record that reflects this. I can't imagine a bigger stimulus for gun sales than this." Fitz-Gerald further posits gun executives, who are notoriously conservative generally speaking, may actually cast their lot for Hillary in secret once the voting booth curtain is drawn. Whether or not that's the case, with a strong possibility of Clinton taking the Oval Office in 2016, there's likewise a strong possibility gun stocks will continue their bullish run. That's why Fitz-Gerald likes Smith & Wesson and Vista Outdoor Inc. (NYSE: VSTO) as the best stocks to buy now to play the trend. Many analysts believe that Smith & Wesson is poised for a pause after a blistering 759% run over the last seven years. Given the scenario I've just laid out for you, I believe there's still plenty of upside. The company makes and sells firearm products in the United States and internationally through two key segments: firearms and accessories. The company offers handguns, rifles, and all manner of law enforcement equipment. This international customer base, though, is a key reason I prefer Smith & Wesson to its more U.S.-centric competitors like Sturm Ruger at the moment. While it's true that the U.S. has 45% of the world's armed civilians, other countries are seeing renewed interest in firearms. Austria, for example, just reported record gun sales in Vienna, as citizens arm themselves in the face of a destabilizing mass migration that's causing new fear and safety concerns. More than 70,000 guns have been sold this year despite a rigid permitting process. Shotguns, according to press reports, are sold out. Lines outside government offices for the required paperwork are now common. Women, ironically, are the key driver in a new personal arms race. Smith & Wesson is perennially underestimated. Socially it's the financial equivalent of a stray dog that you begrudgingly welcome to the family picnic. That sets up a contrarian opportunity based on nothing more than sentiment. The company has just reported its 17th consecutive earnings beat and it's trading at a price/earnings ratio of 19.54, according to Yahoo!Finance. That's not exactly inexpensive, but it's not outrageously out of line either. The price/earnings growth (PEG) ratio of just 1.08 confirms that it may be solidly valued when you consider its long-term growth prospects. Vista Outdoor Inc. (NYSE: VSTO) was created as the result of a spin-off earlier this year. It's already piling on the profits and has returned double digits to date. The company makes all kinds of outdoor products and is organized into two self-explanatory divisions: shooting sports and outdoor products. It's best known for brands like CamelBak, Bushnell, Bolle, and Federal Premium, just to name a few. But it's also a top ammo and scope seller. While it's slightly more expensive than Smith & Wesson and has shown more modest quarterly growth of 5.7%, VSTO takes you beyond firearms by offering exposure to high-value, high-margin consumer outdoor gear. 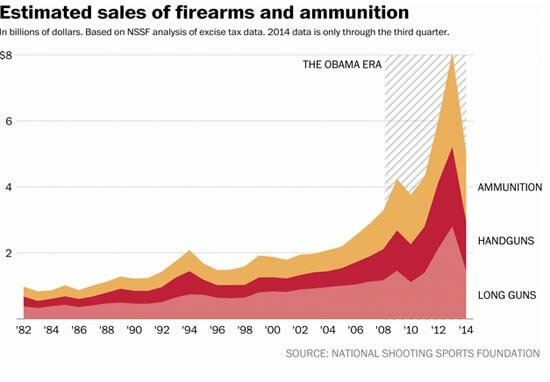 And with taxes on ammunition being one of the most potent rumors powering gun sales in America, VSTO (which didn't exist in 2008) could be a major beneficiary of Clinton's rhetoric, if not her policies. The Bottom Line: Fitz-Gerald stresses that guns are a very contentious issue at the moment – that's not something he takes lightly. But when you take the emotion out of the investing process, they merit examination just like any other alternative. "As we have discussed several times, sin stocks – including firearms – are usually more about value than vice when you get right down to it. And that means they can introduce an element of stability in your portfolio," Fitz-Gerald said. "And that's an opportunity every investor should understand – regardless of whether they support Hillary Clinton or any other candidate."